In a previous post a month ago (Dec 13, 2014) I suggested that my personal plan at that time for this NT mining company, if investing (I didn’t), was to buy at 8.3 cents, and pyramid my holding after the share-price had attained 10 cents. My first target based on the then current price of 7.6 cents was at 11.5 cents. I suggested holders could then take some profit off the table. This would crystallise a profit of 28% within the month, and return part of one’s capital. It would enable a trader to re-buy later if the share-price eased. Technical analysis is a tool for monitoring share-price movement, and is not a price prediction indicator that continues to be valid. Thus when one target price attained, one should review performance, and adjust the targets as indicated. Markets are in constant flux. Tenant Creek Gold (TNG) exceeded the first target price when it reached 12 cents before easing back towards 10 cents (the issue price for the recent capital raising). After a new issue, it often takes a while for buying demand to return. The present chart picture. It is a 12 month daily candle-stick chart with multiple moving averages plotted, and Fibonacci projection levels shown. Since Dec 13 the share-price has re-bounded off support at 7.5 cents. an impulsive move higher emerged this year which has carried the share-price to a high at 12 cents before easing. the down-trend of the past year has been convincingly broken by the price action. momentum has plateaued but is now returning in an upwards direction. the short-term moving averages have crossed over, and are starting to diverge in an upward direction. The medium-term averages have stopped falling, and are converging. The RSI has moved from over-sold to over-bought territory, as a result of the buying stimulus. There have been two “Gravestone Dojis” in the last three trading days, suggesting trader indecision about the present uptrend continuing. The share-price has recovered from the post new-issue weakness, and is trading above the 10 cent issue price. Resistance has formed at 12 cents. There is hesitancy about future gains at this stage. The shares may well trade in a range between about 9.5 cents and 12.5 cents as buyers assess the likelihood for further gains.at the moment. Should the share-price break through resistance at 12 cents, further gains are likely with a Fibonacci projection target at 61.8% or 14.8 cents. I would be a buyer at best price between 9.5 and 12 cents depending on the market, based on the present bullish outlook. 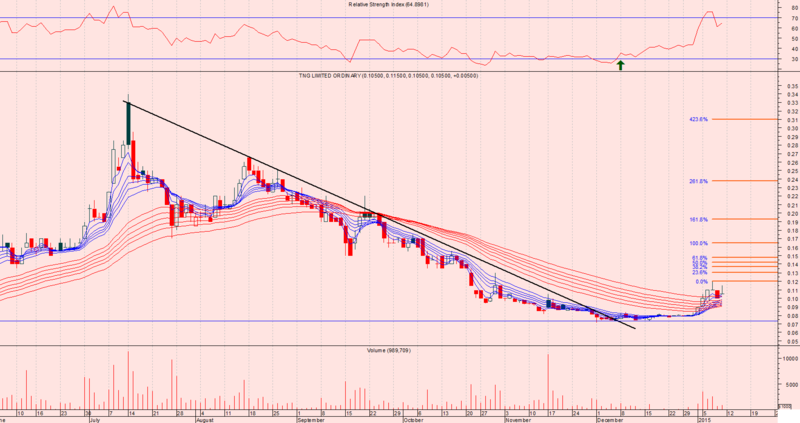 My initial targets for partial profit-taking would at 15 cents and 16.5. I would set a stop/loss position at 9 cents. I would consider adding to my position if instead of range trading, another impulsive move higher were to emerge.